Home / Uncategorized / Get ready for SEAGAZE 2018! 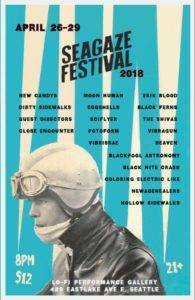 We’re excited to have a slot on this year’s Seagaze Festival – a 4-day series of shows at the LoFi featuring shoegaze, dream pop, post-punk and psych bands. The bulk of these bands are from right here in the PNW, but there are some from points beyond, including one from Italy! We’re playing on the first “official” night, on Thursday 4/26, with New Candys, Dirty Sidewalks and Close Encounter. Get your tickets here! Listen to a preview of many of the bands included.